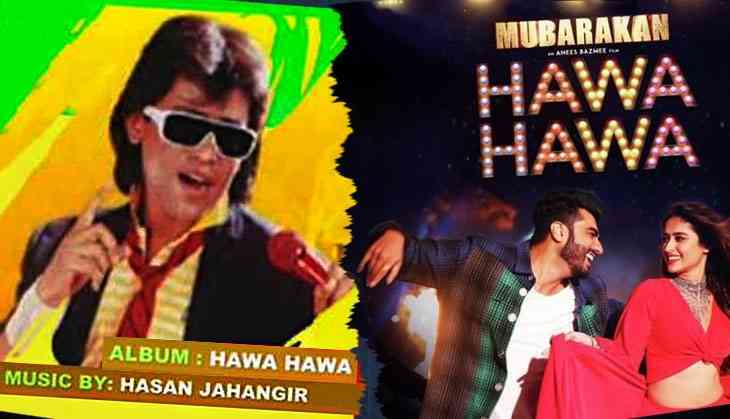 When Pakistani pop singer Hasan Jahangir released 'Hawa Hawa Khushboo Luta De' in 1987, he never expected it would continue to be a rage even three decades later. "I was absolutely sure that the song would be a hit in Pakistan. But that it would continue to remain popular in different versions across the world is something I hadn't thought even in my wildest dreams. I even heard the song being played in shops in Mexico. This is God's gift, truly," Jahangir told Catch over phone. Exactly thirty years after its release, the latest version of Hawa Hawa was released last week. Sung by popular singer Mika, the song - 'Boyfriend Bana De' - is part of the soundtrack of Anees Bazmee's upcoming comedy film Mubarakan, starring Anil Kapoor, Ileana D'Cruz and Arjun Kapoor. Released scarcely a week ago, the video already has over 12 million views on YouTube, a testament to how Hawa Hawa remains a phenomenon even today. What is it that makes Hawa Hawa such a special song? Jahangir believes that its magic lies in its beat. "The beats are extremely catchy and would appeal to people from diverse cultures and musical traditions. Even when you can't understand the language, you can appreciate the beats and the rhythm," Jahangir said. Jahangir says he has no objections to the song being used in Mubarakan in a form that is very similar to the original. However, he does add that the lyrics have been changed considerably, which makes the song seem bad. "Even though I feel they should have asked me, I will not raise objections on such matters as I am a supporter of peace between India and Pakistan," Jahangir told Catch. "There should be peace between our countries and artists like us should always promote the cause of peace. Music has no borders," he added. And for a message of art transcending borders, Hawa Hawa is as good a symbol as any. In fact, it is a song that has traversed at least four countries in as many decades. The journey of this song began not in Pakistan, but Iran. Pre-revolutionary Iran had a flourishing rock-and-roll music scene, and one of its most prominent artists in the 1970s was Koroush Yaghmaei. Simply called Koroush by fans, he is hailed as the father of psychedelic rock in Iran, and is remembered as a guitarist on par with Jimmy Hendrix and Jimmy Page. In 1974, he released his first major album Gol-e-Yaakh, which featured a song called 'Havar Havar' (Shout Shout). Many believed that Koroush's records were lost during the revolution. Whether that is true isn't known, but Havar Havar seems to have found its way to Pakistan, where Jahangir adapted the tune in Hawa Hawa Khushboo Luta De. Jahangir has no hesitation in admitting the inspiration for his song came from Iran. "The beat itself is Irani Dadra. Artists take inspiration from diverse sources," he said. Jahangir recalls that when Hawa Hawa was recorded in 1986, and the album was finally released in 1987, people were skeptical of it. "They made fun of it...[they] said 'hawa hawa, yeh kya bana diya'. I was very dejected after that. One day, soon after the release, my car stopped at a traffic signal and I could hear Hawa Hawa playing inside a vehicle. Soon I began hearing the song in shops, parties, everywhere. It had become a rage, beyond my expectations," Jahangir remembers fondly. He recalls an interesting anecdote about how he had to change the lyrics of the song because of General Zia-ul-Haq. "As you would know, Pakistan was being ruled by General Zia-ul-Haq at that time, and he had a certain point of view. There was a culture of censorship. So when I was supposed to perform Hawa Hawa on Pakistan TV, the authorities told me that the line 'yaar mila dey, dildaar mila dey' is too intimate. So I had to change it to 'waada kiya tha, aik baar mila dey' while performing," Jahangir tells us. He says that he feels hurt by any restrictions on artistic freedom, be it due to religious conservatism or due to geo-politics. The restrictions on artists because of Indo-Pak tensions upsets him. "Artists represent love, they shouldn't be subjected to restrictions because of politics," he says. Jahangir's song became hugely popular in India in the late 1980s and early 1990s, at a time when disco music was the rage. It was extremely common in discos, restaurants, weddings, and even the dance bars of that period. Soon, the tune was used by at least two of Bollywood's most prominent music directors - Bappi Lahiri and Jagjit Singh. Yes, Jagjit Singh. Singh used it in a film called Biloo Badshah (1989), and the singer he chose for the song was the film's hero – Govinda! The tune is largely the same as Jahangir's song, with a trace of the 'maine dil tujhko diya' part of 'Ramaiya Vastavaiya' thrown in as well. The same year as this, the song was used by Bappi Lahiri in the Sunny Deol-Dimple Kapadia starrer Aag Ka Gola. The song itself features Archana Puran Singh, Deol, and a host of dancing villains led by Prem Chopra, as well as a pensive police inspector played by Shakti Kapoor. In 2011, Jahangir's Hawa Hawa was used in a remixed form in the movie Chaalis Chaurasi. Jahangir sang the song along with Neeraj Shridhar of Bombay Vikings fame, and the ones dancing to it in the movie include Naseeruddin Shah, Atul Kulkarni, Kay Kay Menon and Ravi Kissen. Over a decade after the original, Hawa Hawa travelled further east, re-appearing in the form of the Bangladeshi song 'O Tunir Ma Tomar Tuni..."
The theme of the song is a boy's appeal to a girl's mother that her daughter goes about dating everyone except him. In that sense, Mubarakan's 'Boyfriend Bana De' has more in common with the Bangladeshi version, than Jahangir's original or even its Bollywood spin-offs, all of which were in the voice of a longing lover. Of course, the song's tryst with religious conservatism continued even in Bangladesh, with a cleric coming up with his own version of 'O Tunir Ma'. Here, the cleric is complaining to the girl's mother that she doesn't wear the burqa or recite the Quran. But the cleric seems to have a keen sense of music as he has embellished his song with some cool beat-boxing, unwittingly proving Jahangir's point, that the beats are indeed the soul of Hawa Hawa.